UK: Edinburgh Marina Holdings (EMH), the developer behind Edinburgh Marina, has appointed McLaughlin & Harvey as its main contractor. The company will be responsible for the construction of the first phase, which has an estimated gross development value in excess of £175 million. GERMANY: Clement Systems is constructing 60 exclusive floating holiday homes with private berths at the Ostseeresort Olpenitz on the Baltic Sea coast. The impressive project draws on expertise the company gained on turnkey floating structure commissions for Emirate Palace Hotel, Marina Abu Dhabi, the floating bridge in Dubai, and more. UAE: Ingemar Group of Italy has formed a strategic alliance with experienced marina builder Overseas AST LLC. The licensing agreement gives Overseas AST the rights for exclusive production and distribution of high-end Ingemar pontoons, fingers and floating breakwaters in the UAE. 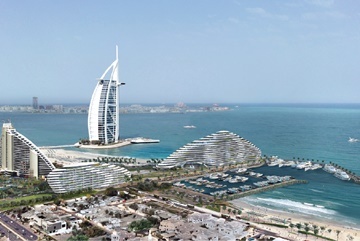 The Mars Al Arab project near Burj Al Arab, featuring two luxury islands and a marina, is due to complete in late 2020. UAE: Further to the joint venture management and technical consultancy agreement reported in the January/February issue with Port de la Mer, Dubai Harbour and Jumeirah Beach Hotel, D-Marin Dubai LLC has signed a management agreement with Al Seef, Marasi and Jaddaf Waterfront marinas. As a result of the latest contracts, D-Marin – already one of the biggest chains in the eastern Mediterranean – has expanded its marina operations network to cover 14 marinas in five countries. Copyright (c) 2013 Marina World/Loud & Clear Publishing. All rights reserved.